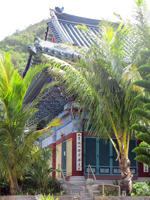 Mu-Ryang-Sa Buddhist Temple is an Amazing Scenic Hawaii Sightseeing Experience. 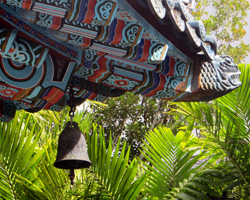 Mu-Ryang-Sa: an Amazing Hawaii Sightseeing Experience! Let me start by pointing out that the Mu-Ryang-Sa Buddhist Temple Hawaii is not a Hawaii attraction built specifically for Oahu tourism. 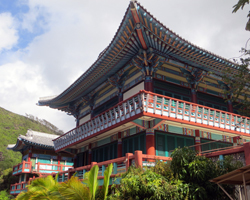 It is a real, active Korean Buddhist temple – the largest of its kind outside of Korea. And it’s a place of meditation and spirituality. It just so happens that it’s also incredibly picturesque. So for that reason, visitors are welcome from 9am to 5pm daily*, according to a sign posted at the entrance. I’ll continue my disclosure by pointing out that I am neither Korean nor Buddhist; so I’m far from being an expert on these topics. What I can talk about with a fair degree of authority is the kinds of Oahu Hawaii activities I would find interesting if I was on Hawaii vacation. Thus, because I love to discover new cultures through their art and architecture, I find Mu-Ryang-Sa to be a visually stunning place for scenic Hawaii sightseeing. 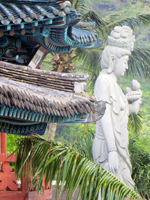 Likewise, if you’re genuinely interested in discovering one of our diverse Hawaii cultures, and you appreciate Asian art and architecture, then Mu-Ryang-Sa is a place of peace and beauty that few others can match. Assuming you don’t live in Korea, or you have limited exposure to Korean Buddhist culture, visiting this little haven is sure to be a treat for both your eyes and your soul. So if you’re looking for unique things to do in Honolulu, this could be an enjoyable and meaningful experience for your family vacation in Hawaii. However, because this is an active working temple and not some ruin that has been refurbished as a visitor attraction, I feel compelled to impress upon you the following points of etiquette. You’re allowed to take pictures outside the buildings only. The people dressed as monks are there for their own spiritual edification – not as paid actors who will pose for silly family photos. There are no snack bars, souvenir shops, or guided tours. There are no guest facilities. There’s no guest parking lot and no shuttle service to bring you in from your hotel. In other words, it’s not Disneyland; and you shouldn’t act like it is. If you want Disney, go stay at Aulani. It too has impressive art and architecture, and nobody will mind if you want your picture taken with Mickey Mouse dressed in a Hawaiian-print aloha shirt. *Groups of more than five need to make reservations in advance (link opens a new tab/window). Located near the back of Palolo Valley in Honolulu, Mu-Ryang-Sa is a little off the beaten path. However, you’ll drive right past it if you decide to hike the Kaau Crater trail. You’ll need to park on the street outside the temple grounds and walk in. Because this is a residential neighborhood, please be mindful not to block any roads or driveways. Once you get onto temple property, you are asked to make a donation for each member in your party. Although there is no ticket booth and probably nobody will ever approach you asking for money, you can and should make your donation in any of the donation boxes scattered about the property. One of the first things you might notice upon your arrival is that there’s an unexpected look about roof of the main hall – like the top was cut off. That’s because, in a sense, it was. During construction, they discovered that the planned roof height exceeded City and County of Honolulu limitations, and the design had to be modified shorter. If I understand the story correctly, that’s why this temple was called Mu-Ryang-Sa, which means “Broken Ridge Temple”. You’ll enter the temple grounds through the Gate of the Four Heavenly Kings. Though distinctly different than the way I’ve always imagined heaven’s gates to be (with Peter and pearls), it is nevertheless a grand entrance. Then you’re free to walk the grounds and take in all the glorious scenery. I’m sure you’ll be struck by the large and ornately decorated buildings at first. But once you get past looking up at all the splendor, take notice of the little things as well. 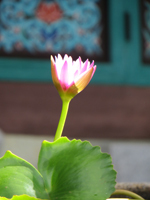 I took this picture of a water lily directly outside the Great Hero Hall where people were gathering for what seemed to be morning prayers. I had just focused on the flower when the sun rose over the tree line and sunlight seemed to sit briefly within the petals of the flower, as if rising from the flower itself. As a result, this is possibly my favorite photo I’ve ever taken. So amid all the grandeur of the grounds, a single flower made my experience magical. 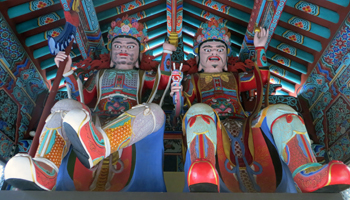 Other points of interest at Mu-Ryang-Sa include replicas of famous Buddhist monuments in Korea, such as the World Peace Pagoda in the middle of the main lawn, the bell in the bell tower, and a statue at the back of the courtyard. As you make your way through the grounds, be sure to go up the stairs in the back right corner of the property. 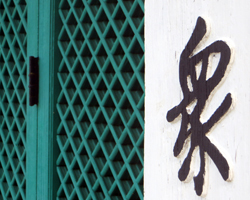 That’s where you’ll find the Garden of Ji Jang Bosal. 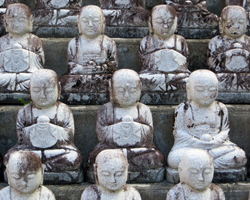 But unlike most gardens that might come to mind, this one is alive with 1080 miniature Buddhist disciple figurines. That’s not something you see every day. 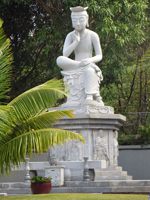 If you want specific information relating to the art, architecture, and historical/traditional significance of the various structures at this Honolulu attraction, you can read more directly from the experts at Mu-Ryang-Sa (link opens a new window/tab).